If blasting rods and staffs are standard wizard fare, what do they use for euphemisms? Harry Dresden is having a bad day, or is that week, month, and year? His girlfriend has been semi-turned into a vampire, it’s raining frogs in the park, a ghoul is trying to assassinate him, the vampire Red Court want to torture him to death, the Wizarding White Council are tempted to let the vampires have Harry, the Winter Court of faeries want him to investigate a murder, he has no money, and his house is a mess. Oh, and a war is about to start if Harry can’t find the killer; so there’s that as well. 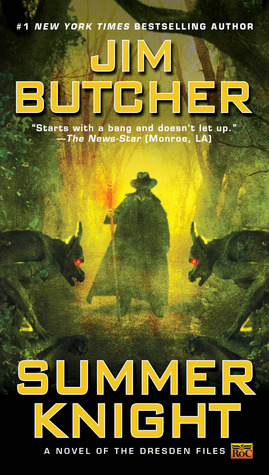 This is my first foray into Jim Butcher’s much vaunted Dresden Files series. Summer Knight indicates that there is a lot to like about this Harry’s world. The story could be described as an urban fantasy thriller: with thriller being a selling point for me. Butcher doesn’t shy away from piling on the hardships for Harry to overcome, and keeps the action coming thick and fast. I’m honestly wondering why I took so long to dive into this series that has been repeatedly recommended to me.